SYNOPSIS: A moist east-northeasterly airstream is producing rain and light to moderate showers mostly over the seas and coastal areas of the Belize, Stann Creek and Toledo districts this morning. The rain clouds have spread inland over the Cayo, southern Orange Walk and Toledo districts by noon, as indicated by the latest IR satellite images. An active frontal boundary in the Gulf region of the southern USA will drift southwards over the next 24 to 48 hours, but the southern portion of this cold front will weaken and dissipate as the upper level support ceases, and the surface continental high stops advecting cold air southward, as it shifts to the NE. 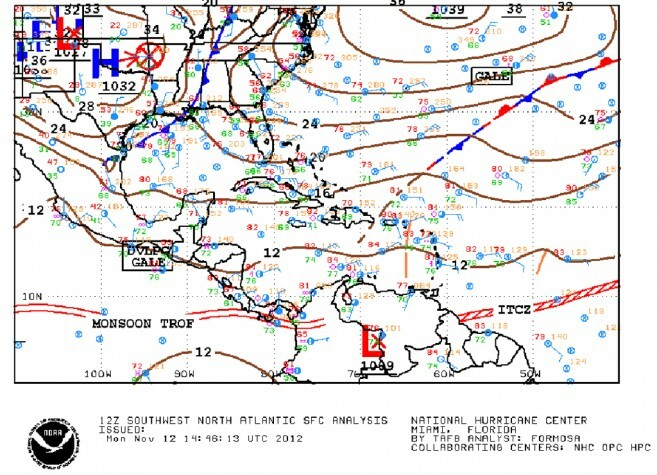 A backing in the low level flow over Belize and the NW Caribbean is expected by the next 48 to 72 hours, as the cold front and the building high pressure ridge edge southwards in the central Gulf by Wednesday; however by Friday the flow will be returning to a drier easterly airstream. Thus, we can expect the moist, unstable airflow to remain over the region through Wednesday and early Thursday, drying out as we move into Friday and the holiday weekend. 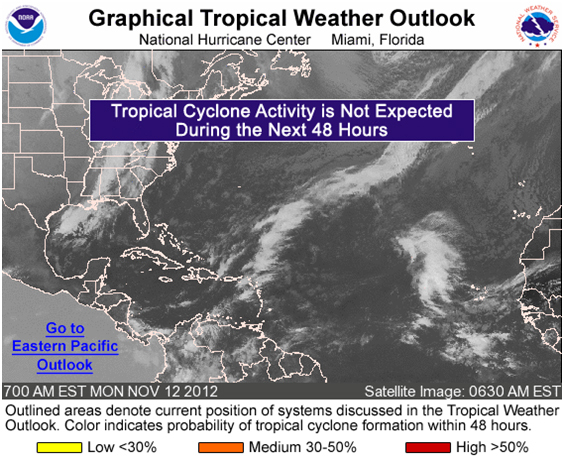 No tropical cyclone is expected to form over or move into the Caribbean region during the next five to seven days. Rainfall rates over the sea and coastal regions of Belize will be ranging from 0.25-0.50 of-an-inch Monday through Wednesday in moderate showers and periods of rain. Daily rainfall accumulations will be less over the rest of the country, with daily totals of only 0.10-0.25 of-an-inch, generally. The rains will diminish over all districts and coastal water later on Thursday through the holiday on Monday, except for localized heavier showers over southern coastal areas late Sunday through Monday. Figure 1 GOES 13 IR Satellite picture for 10:15 am, Monday Nov. 12, 2012, showing layered cloud mass over and off shore southern and central Belize. 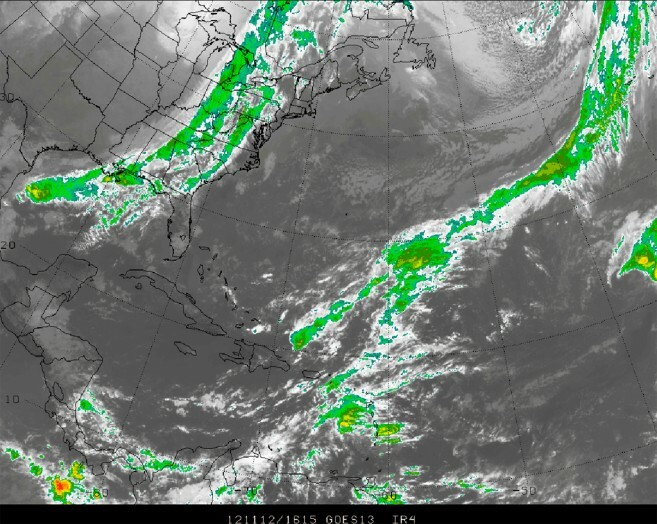 The broader band of convection in the W Gulf of Mexico is associated with a cold front in the northern Gulf. Figure 2 NHC surface analysis valid for 9:00 am Monday, Nov.12, 2012, showing weakening ridge over the NW Caribbean generating an easterly airflow. Figure 3 GFS-model 24 hr Rainfall projections valid for 6:00 am, Tuesday, Nov. 13, 2012, showing 24-hour rainfall accumulations of 0.25 to 0.50 of-an- inch along coastal areas and offshore waters. Figure 4 NHC 48-hr forecast surface map, valid for 6:00 pm Tuesday, Nov. 13, 2012, showing southern portion of cold front in the central Gulf of Mexico weakening, as push of cold, continental air toward the south diminishes with NE drift of the continental High. Figure 4 NHC 72-hr forecast surface map, valid for 6:00 pm Wednesday, Nov. 14, 2012, showing ridge of high pressure dominating the NW and western Gulf of Mexico. The southern portion of the cold front dissipated over the Gulf of Mexico , while the broad continental high generates a moist, NE’ly airflow over the NW Caribbean and Belize.